Boeing’s new KC-46 Pegasus tanker completed its maiden trip across the Pacific Tuesday when it touched down at the home of U.S. Forces Japan in western Tokyo. A version of the aerial refueler, which is based on a 767 airliner and designed to replace old KC-135 and KC-10 tankers, was parked on a ramp at Yokota on Wednesday morning. It had, according to car technology website The Drive’s “War Zone” blog, flown there from Edwards Air Force Base, Calif., after a stop at Hickam Air Force Base, Hawaii. It is designed “to carry passengers, cargo and patients and can detect, avoid, defeat and survive threats using multiple layers of protection, which will enable it to operate safely in medium-threat environments,” the company said. 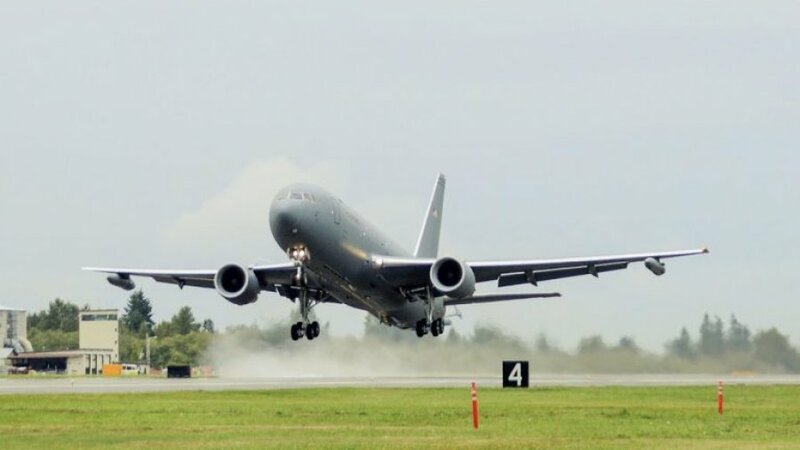 p class=”krttext”>But Carl Baker, executive director of the Pacific Forum foreign policy research institute in Hawaii, said the KC-46’s rollout has been a headache for the Air Force, which had been slated to buy Airbus’s A330 tanker before the contract was awarded to Boeing in 2011. “Ever since then Boeing has had a problem trying to work this thing,” he said, noting that the first production model had been due in 2015 but was delayed again this month. “They have had mechanical problems trying to work out the [refueling] boom and aerodynamics,” he added. Air Force tankers, including those forward-stationed at Kadena Air Base, Okinawa, are vital to operations in the Pacific since jet fighters must refuel several times to reach Japan and South Korea from the United States. For example, during combat operations in the Middle East, tankers circle the battlefield so fighters can refuel and stay in the fight without landing, Baker said. “Any big operation will have a tanker sitting off to the side to keep those guys in the air,” he said. The trans-Pacific flight shows Boeing should soon be ready to roll out production-line versions of the KC-46, Baker said. Japan became the first overseas buyer of the aircraft in December, according to a Boeing statement that priced the contract for an initial tanker and logistics support at $279 million.